Inspired in part by an email we received from an inquisitive reader (thanks P. Gauntlett! 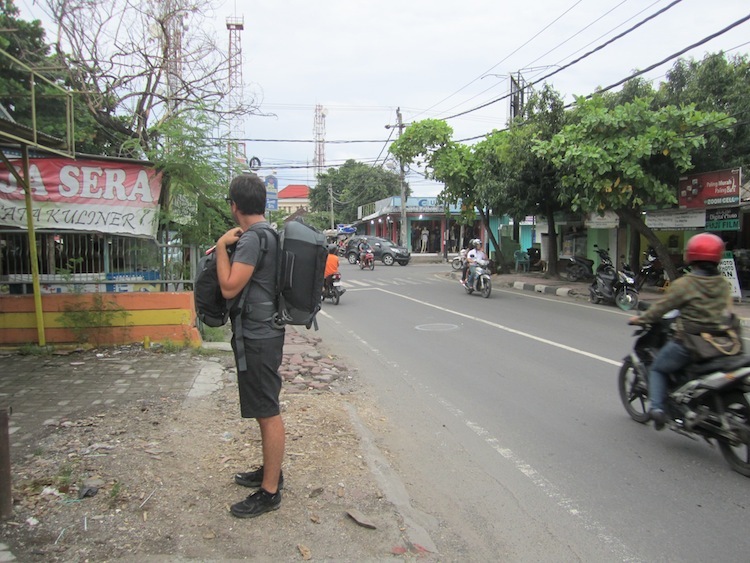 ), I’ve decided to write an updated review of the Osprey Meridian 22” (2011) pack now that we’ve been travelling with them for almost 3 months. …Julie and I have both been extremely pleased with the overall performance of our bags, and continue giving ourselves high-fives whenever we switch between towing it on wheels (when the going is smooth) to hoisting it up onto our backs (when the going gets tough) because of how proud we are of our decision to buy hybrid packs. 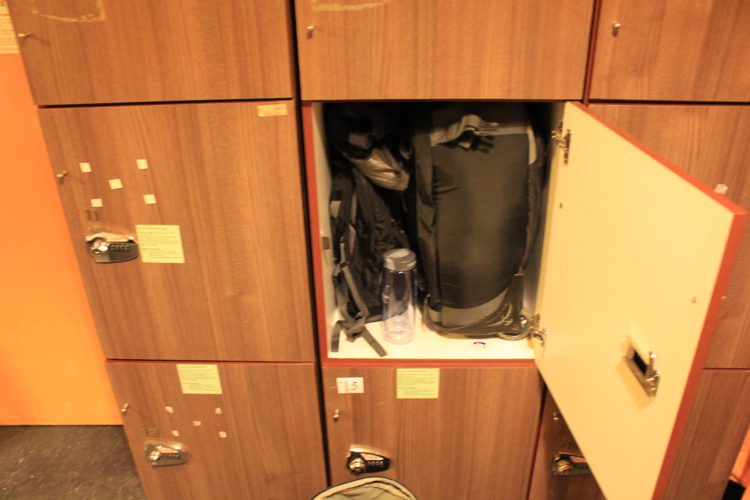 The full pack fits well into most mid-size lockers that we’ve encountered, as well as most train and bus overhead storage areas. 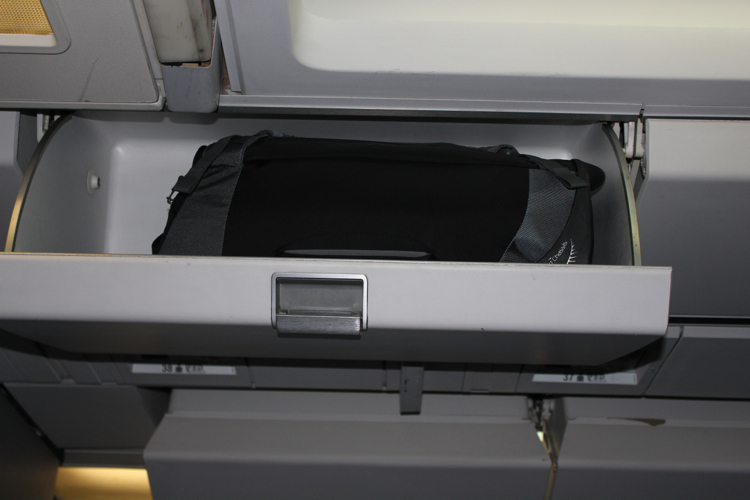 Unfortunately, on the majority of budget airlines outside of North America, they have not been as easy to smuggle on as cabin baggage as we’d originally hoped. Our first flight was with Air Canada (YYZ-LAX) and in Toronto we were able to print our boarding passes from the automatic machine at the terminal and head straight to the departure gate, thereby avoiding any pesky airline staff wanting to weigh our luggage. 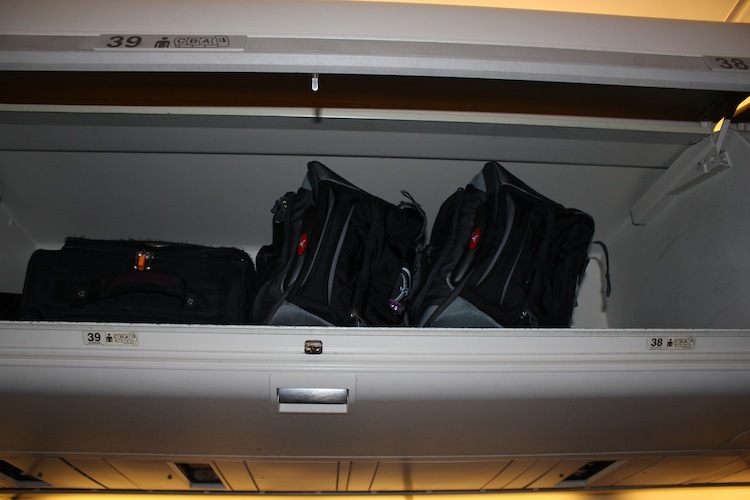 The main bags fit nicely into the overhead compartments, so we weren’t hassled by anyone onboard either (which we probably would have been had the bag not fit up top), and we made it to Los Angeles without having to check any bags. The next leg was a long haul from LA to Fiji on Air Pacific, and although we had to go to the check in counter and get our next boarding passes from an actual human being, they weren’t too strict and didn’t ask, so we didn’t tell, and again had no trouble fitting the main packs into the overhead compartment on board (the day packs fit fine under the seats in front of us and would definitely fit up top too had we wanted more leg room). In LA, we’d been given boarding passes for our final flight (also Air Pacific) from Fiji to our intended destination of Auckland NZ, so even though we switched to a smaller plane once in Fiji, we still had no trouble getting the bags past airline staff, onboard the aircraft, and into the overhead storage. Following two stellar weeks driving around New Zealand (both islands!) 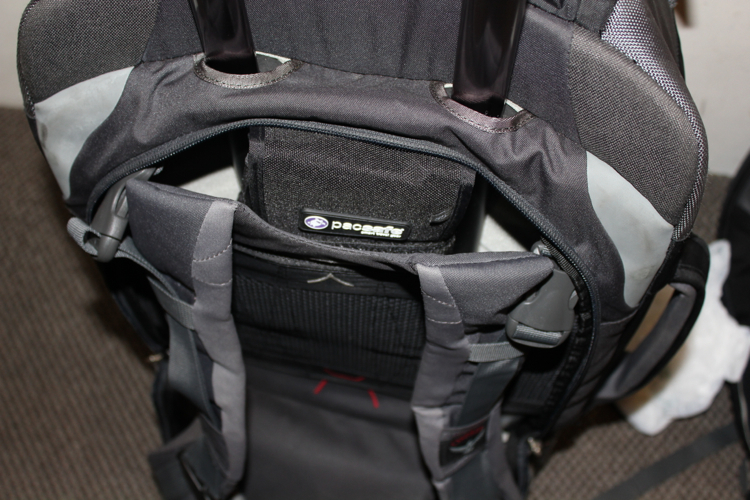 and not having to use the built-in harness to carry it even once, we were scheduled to fly from Christchurch to Sydney, Australia on the budget airline Virgin Australia. We weighed our bags using a trusty little hand scale I got with Aeroplan points before our trip, and found that we were pushing 12kg each for the main pack, and another 3kg each for the day bag (for a combined weight of around 15kg each). After scouring the fine print of the airline’s very strict rules and regulations for cabin baggage and doing a fair bit of online research, we realized that with all the weight in the bag and the fact that it exceeds the allowed size limit by a material amount, there was no way we were going to be able to get away with not checking some luggage (the packs linear dimensions are 128cm, and empty it weighs almost 4kg, but the combined; meaning carryon luggage and purse or laptop bag, cabin baggage weight limit for Virgin Australia was 7kg, with a linear dimensions limit of 105cm). If we’d been able to print out our boarding pass from an automatic machine, or avoid talking to airline staff completely, we might have been able to get away with it, but we had to physically attend the check in counter to get a boarding pass, and if we’d showed up with no pre-purchased checked luggage allowance, we would have been gouged supremely (~80$CAD for a single bag up to 20kg) to check a bag last minute. Being the risk averse investors that we are, we decided that taking advantage of Virgin Australia’s pre-purchased checked baggage allowance (~15$CAD for a single bag up to 20kg) was the best way to avoid last minute and potentially devastating charges to our pocketbook. and you’d be correct in that assertion. 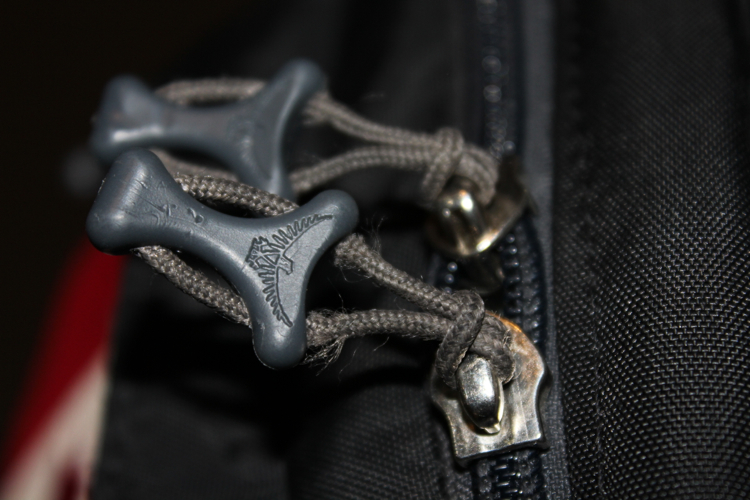 Which is why we were (are) so happy with the 4-clip system for attaching the day bag to the main pack, because we’ve been able to bend it to our whim and use it to attach both of our main packs together! We also brought a luggage strap with us, and we wrapped that around the whole 20kg-on-the-dot-mess to give it a single point from which to hoist or lift it up onto the baggage carousel and to make sure it’s obvious that it fits the ‘single bag’ criteria. 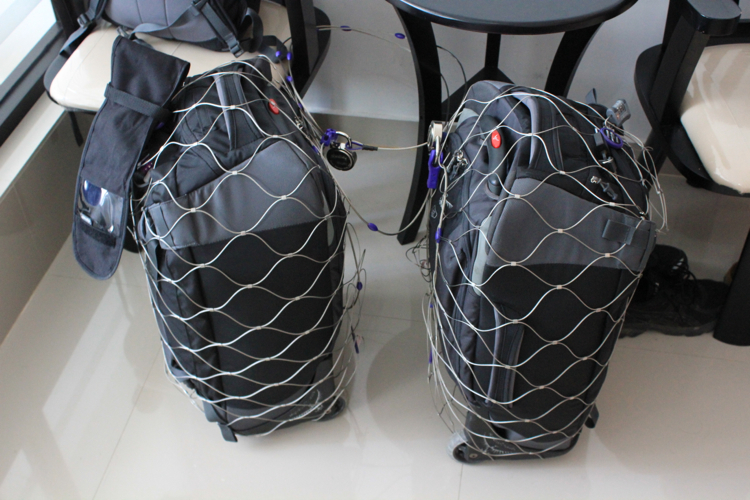 Oh, and the wheels still worked even when both packs were strapped together! 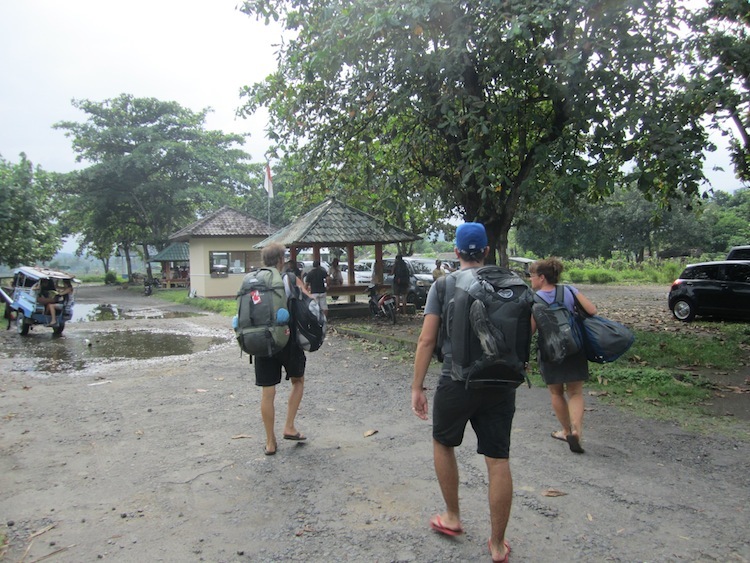 Hence, although we couldn’t avoid checking our bags completely, at least we were able to forego spending even more additional funds on checking two bags. 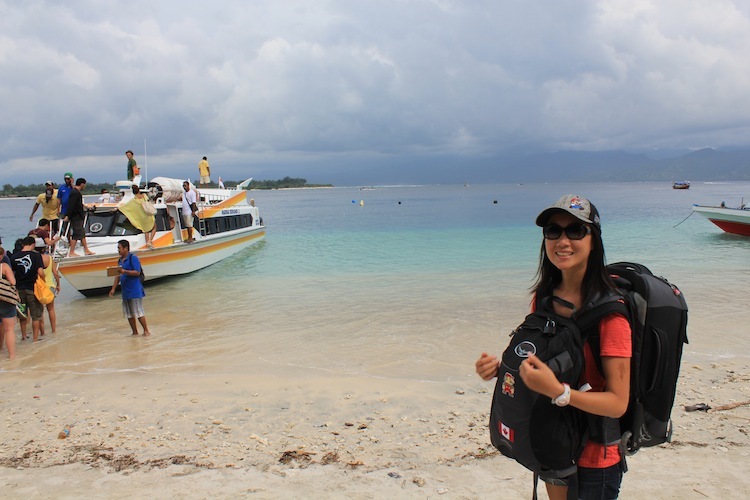 We had similar experiences with Tiger Airways (Sydney-Melbourne and Melbourne-Perth), and also Air Asia (Perth-Denpasar, Indonesia and Denpasar, Indonesia-Singapore), where we decided that due to the strict rules of these budget carriers, we’d be better off pre-purchasing a checked baggage allowance. 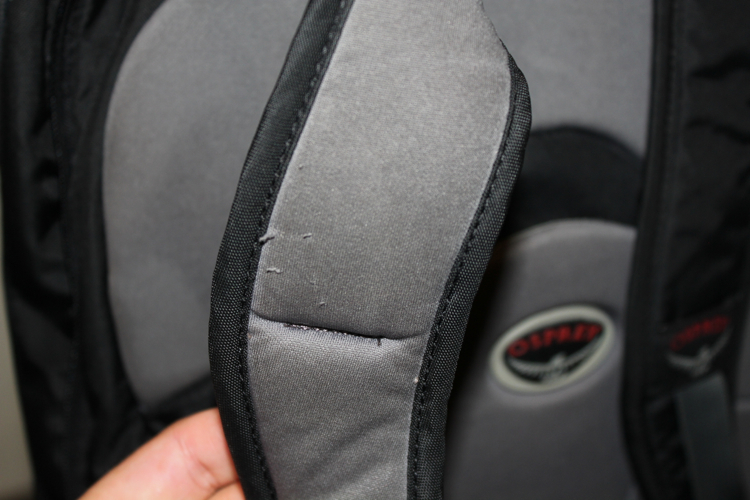 As far as durability of the pack, it is surviving the abuse we’ve been dishing out quite well. 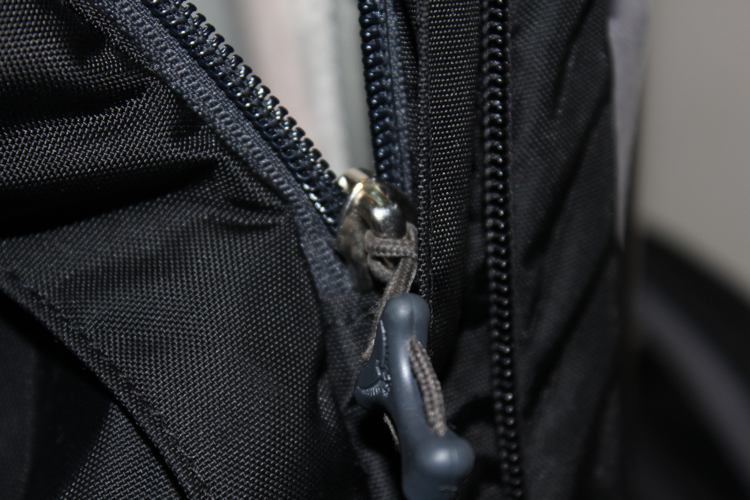 The zippers are still functioning like new and appear hardy enough to withstand the constant over-stuffing that I’ve been doing, although some wear is noticable on the zipper pull cords (and I hope they don’t deteriorate to the point of fraying and breaking off…). 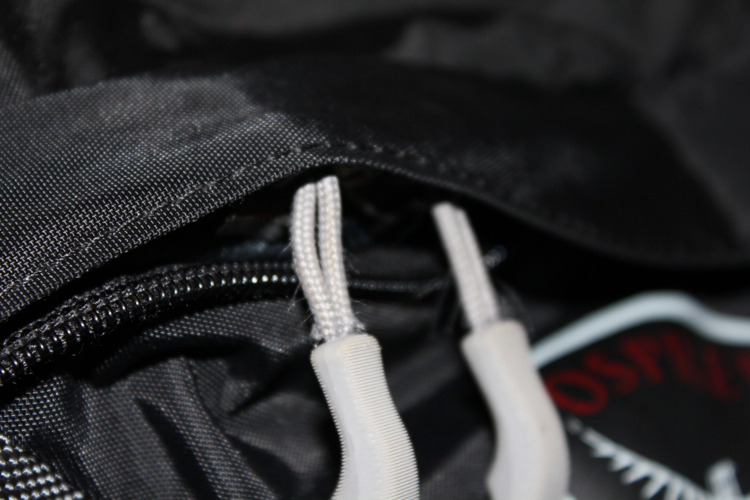 The seams and sewing are all intact, and the fabric isn’t fraying, although there is some loosening of the weave on high-friction areas and a couple loose threads on the contact area of the day bag straps (but nothing that indicates the bag is about to fall apart or anything). Both the main pack harness and the simple day pack straps are well fastened to their respective pack propers, and even with an unnecessarily heavy load (I bought 500g of coffee and a stainless steel travel french press like a true coffee snob, and recently ‘invested’ in reef walkers, mask and snorkel, all of which are absolute frivolities for a RTW trip such as ours, but seemed like a good idea at the time), all the heaving and hoisting and carrying and setting down roughly hasn’t caused any strap weaknesses. 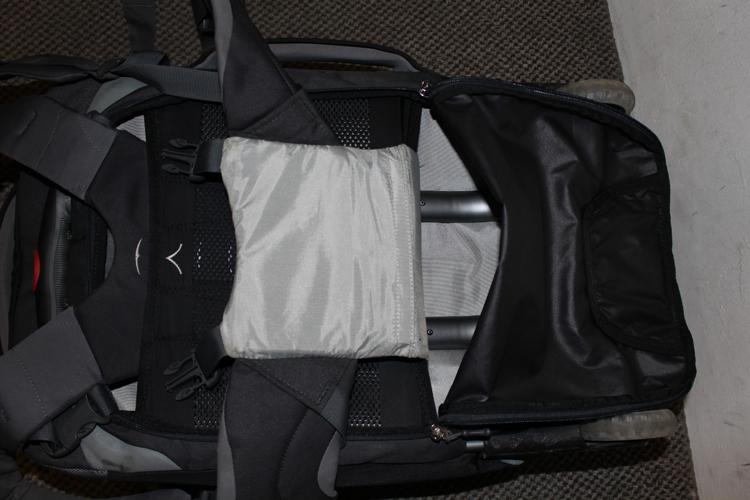 I’ve also re-discovered a bunch more storage space in the back zipped area where the harness is stowed, and made use of that to lug around some stuff I don’t use much (like my pacsafe exomesh lock). The corners and heavily abused bottom areas have been thoughtfully designed to withstand the extra beating, and so although there are a number of scratches and scuffs, the construction is such that it will take a heck of a lot more to cause any actual performance issues. 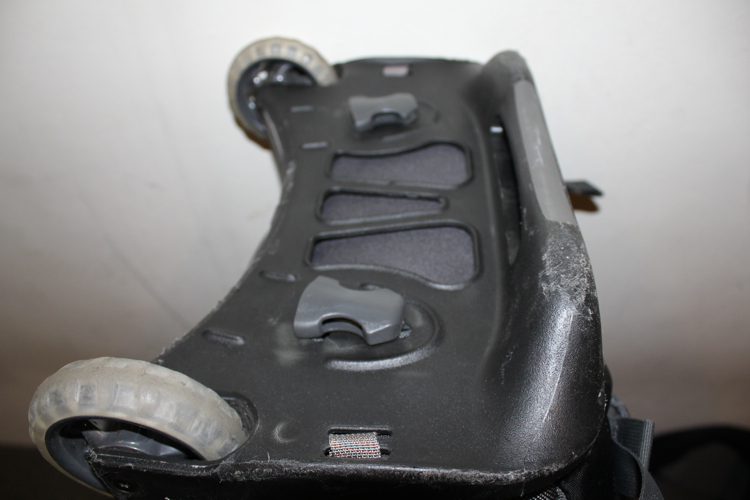 I’ve been absolutely cruel to the wheels, dragging my bag up and down stairs, over curbs, along poorly cobbled streets, and generally just over the roughest terrain I can find (before eventually wising up and pulling out the harness to carry it), and they are definitely up to the task. The axels and bearings are just fine, as are the hubs and even the physical rolling surface material (albeit with a few small pieces of Balinese gravel embedded in it now). Considering that the oh-so-important telescoping handle consists of a number of moving parts and has (I assume) mostly plastic innards, it too is handling (:D) my incessant pulling, lifting and dragging like a champ, and I am especially glad of the dual telescoping bar system, which allows me to counteract the rotational forces perpetrated by me pulling it over a big curb at an angle much easier than if it were a single telescoping bar system handle (like our purchased, reviewed, then returned for full refund North Face Doubletrack 21”). There is however one glaring design flaw that could very easily render the entire bag useless, and I am getting more and more concerned about what I’m going to do should the anticipated outcome occur. 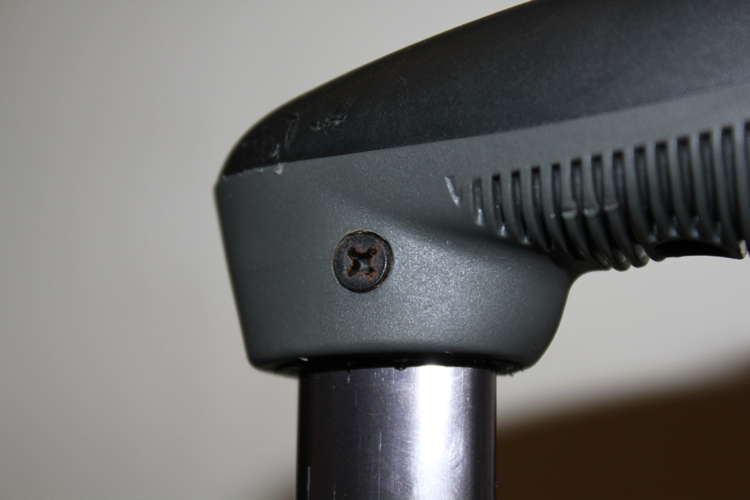 Namely, the little metal screws holding the important parts of the bag together are coming slowly loose (the metal tube frame to the plastic chassis, and the plastic handle crosspiece to the two telescoping bars), and they are also rusting! If one of the bottom screws falls out, I’ll probably be able to keep going because at least they had the foresight to put two in each side, but the top handle is held in place by one screw on each side only, and if one of those drops out and gets lost, I’m not going to be able to… handle it (ok ok ok I’ll stop with the terrible puns). 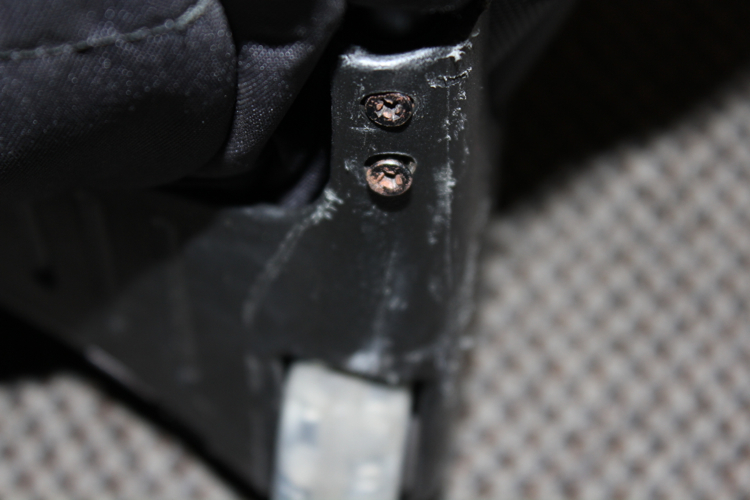 In all seriousness, I’m quite shocked that Osprey didn’t apply loctite or something to the screws during installation, because that would go a long way to combatting this issue, and if they really wanted to ensure this didn’t happen, they’d use bolts with lock nuts or something a little bit more permanent (I’m generally not a fan of rivets because they break easily and are impossible to replace, but maybe some high-strength variety could be employed here?). Also, why not use proper stainless steel or something else that is less susceptable to oxidation? For the time being, I’m going to keep an eye on the screws, but if I have an opportunity to purchase a tube of loctite I’m going to double dose all the screws and re-install them. If the screws do fall out while I’m not looking, I’m not going to be very happy about it and might have to write Osprey a tersely worded email in addition to taking a very in-convenient day trip to find out if their lifetime warranty is worth the paper it’s printed on (fingers crossed it is, because I wouldn’t want to get stuck in the middle of the Laotian jungle with a broken pack). 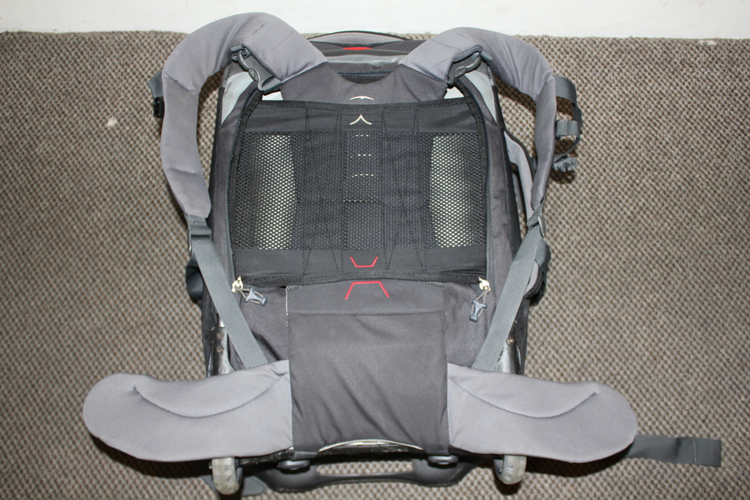 I realize that Osprey has a new iteration of the Meridian pack out already (2012 model I believe?) and maybe they’ve rectified this flaw since, but I’ve only got my otherwise trusty 2011 model to review until they comp me the new one, so I can’t speak to that yet. In conclusion, the Osprey Meridian 22” (2011) is performing very well at the 3-month point in our trip, and it has been well worth every penny spent on it so far. If you have any additional questions or comments, please don’t hesitate to get in touch. Great review. 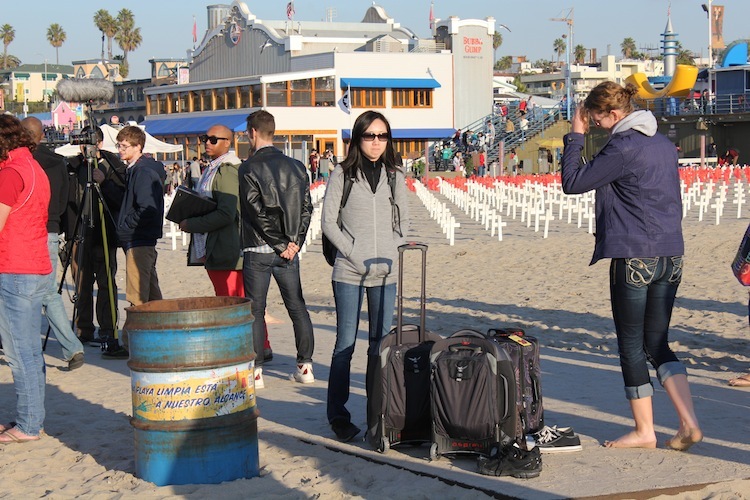 Loved how you strapped the two bags together as a check-in. How do you find the comfort of the bag fully loaded? 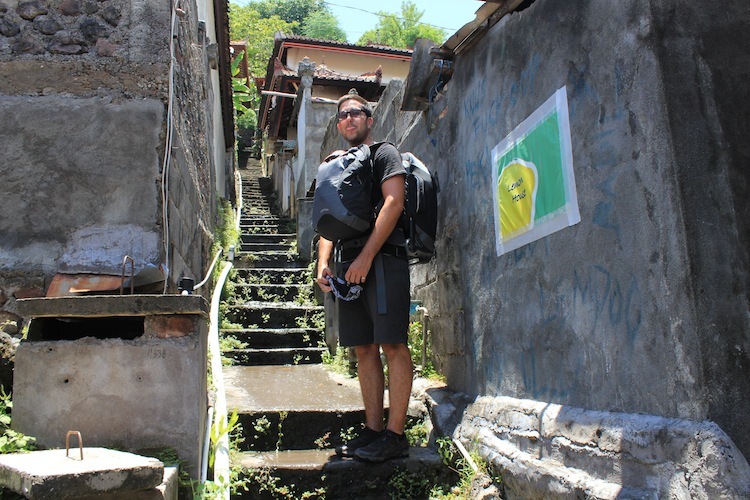 I had the newest version, loaded it to the brim with the daypack attached and found it extremely uncomfortable and awkward. 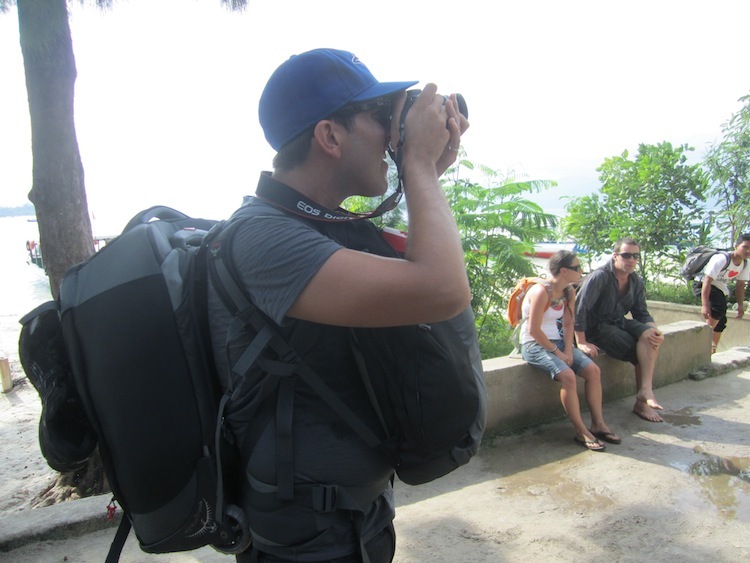 I can see why you guys wore the daypack in front. Also after my one trip, the screw on the handle started inching its way out and probably would’ve fallen off if I didn’t notice. As far as Air Asia trying to get away with baggage, mileage may vary. When I did the HKG -> KUL they didn’t care but from KUL -> HKG, they had staff with a scale sitting at the gate checking passes and weighing the carry-ons. 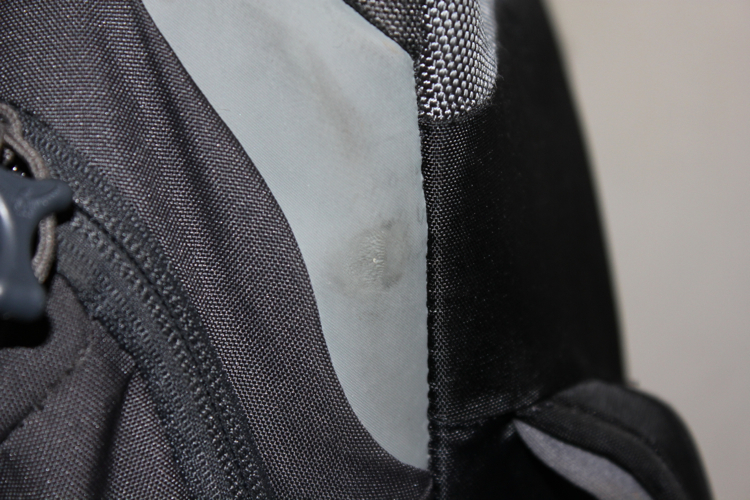 Upside is, they didn’t seem to care about the weight of the personal item, so if you can stuff the heavier stuff in the daypack, you might get away with it. We definitely didn’t find the fully loaded bag very comfortable with the day pack zipped onto the back, but the main pack by itself was quite tolerable (with the day bag balancing the load in front). It’s good to know that Air Asia isn’t all that consistent with their weighing of cabin baggage, so we will definitely try to be a bit more bold getting the main pack on. 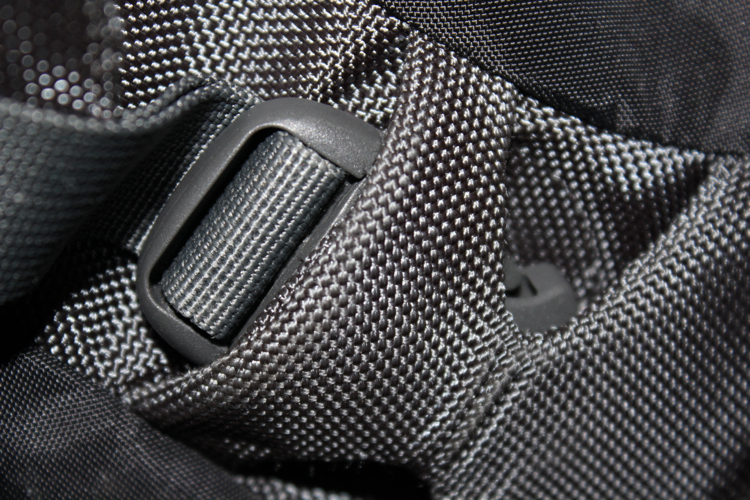 You mentioned that you have the newest version of the bag, which worries me that Osprey hasn’t dealt with the screws-falling-out issue that we are experiencing too. 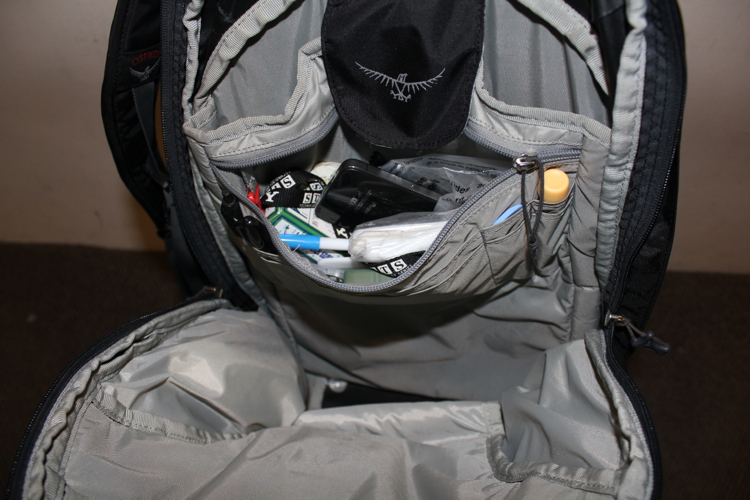 Do you feel confident taking your pack on another trip with the screws about to fall out? I’ve actually been thinking of writing a further update now that we’ve been using them for over six months now. Any suggestions for more info you’d like to know about? Hi Adam, thanks for your quick reply! Áctually, we have one question 😉 What about the screws? Are they still doing there job? And overall: are you still happy with your choice? Looking foward to your upcoming post! Actually one of the screws in the bottom of Julie’s bag did fall out and go missing, but the bag is still in one piece so fingers crossed that the other one stays in. Also, the lower screws in mine are all loose and I have to tighten them after every dragging session, but it hasn’t caused me actual trouble yet. And overall, yes we are still very very happy with the meridians, and I’d definitely recommend them to anyone for a RTW trip. 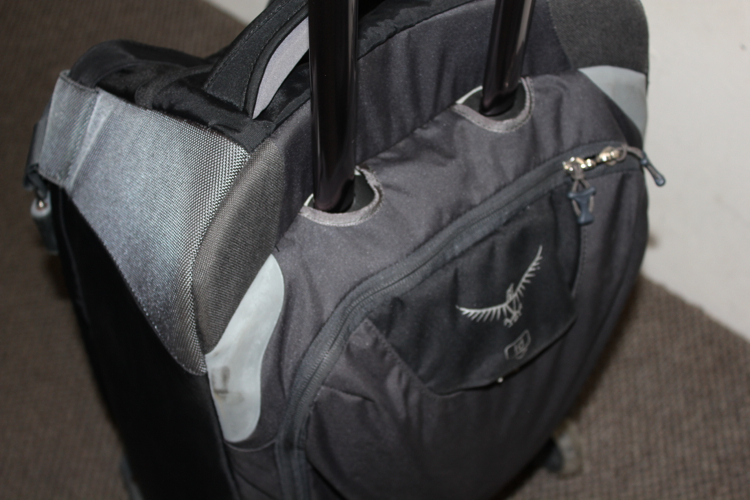 Unfortunately, we have not had favorable experiences with the Osprey bags using European budget airlines. 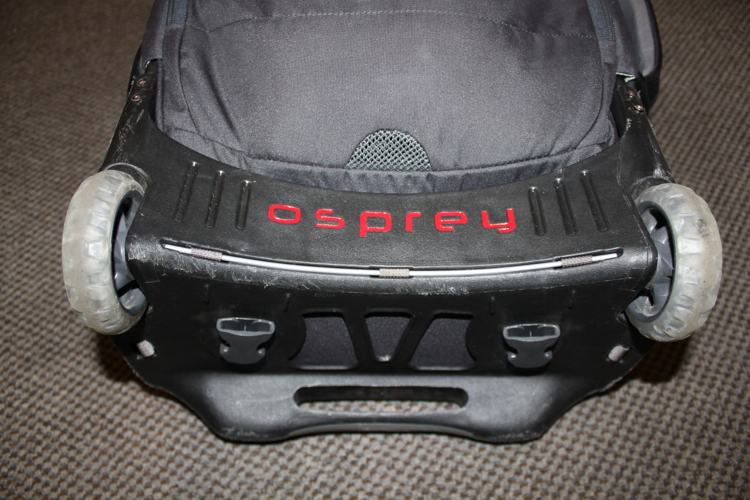 They would not accept the luggage-strapped “one-piece” strategy and they check extremely thoroughly and the Osprey 22 Meridian does not fit into their test “sizer” even without the front pack on. The wheels and frame are too big. We had four of them and had to pay 40Euros each to check at checkin. 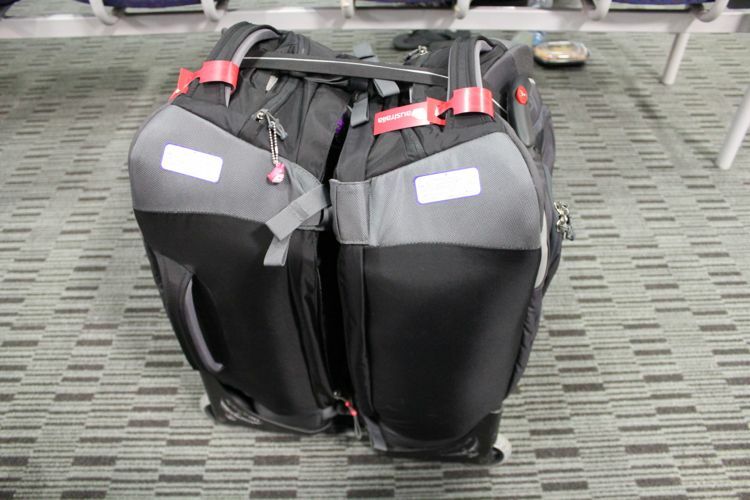 Love the bags but worthless for budget European airlines – RyanAir, BlueAir and Wizzair. Thinking of returning them to REI after this trip. Thanks for the info, and I’ll definitely keep that in mind before lugging them all the way to Europe! 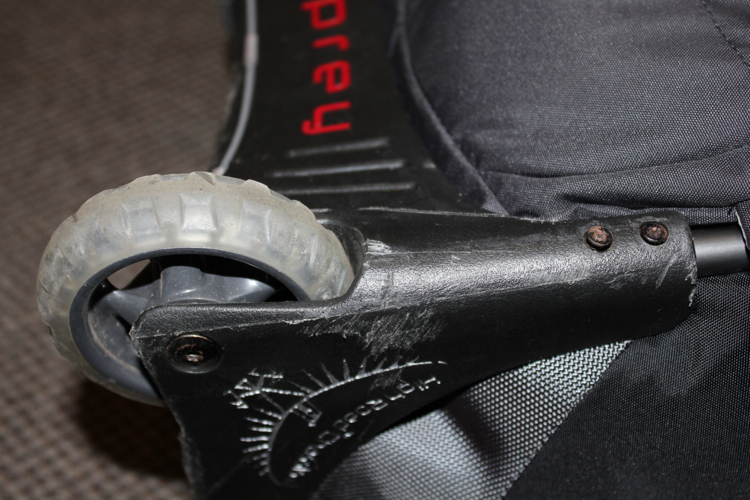 Unfortunately we did not have good experiences with our Osprey meridian 22s with budget airlines in Europe. The airline would not accept the “luggage strap as one piece” strategy. We tried twice. 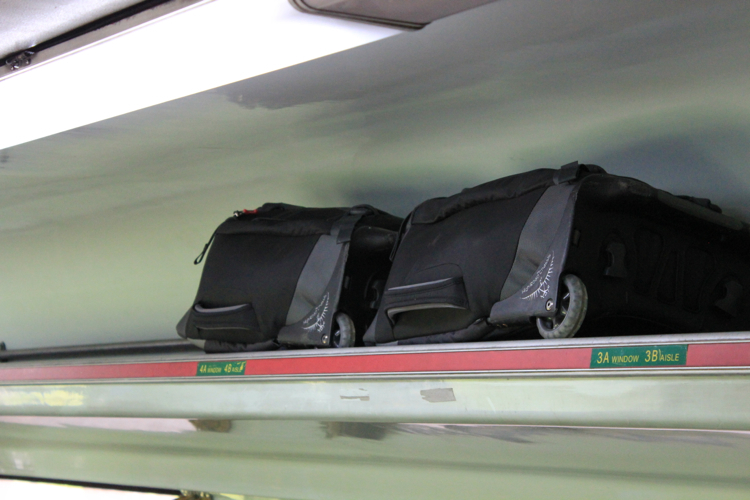 And the bags would not fit in the test sizer for overhead baggage used. We had to pay 40euros for each bag to check as baggage and there were four of us each with an Osprey so it was 160euros!! This is for RyanAir, BlueAir and Wizzair. 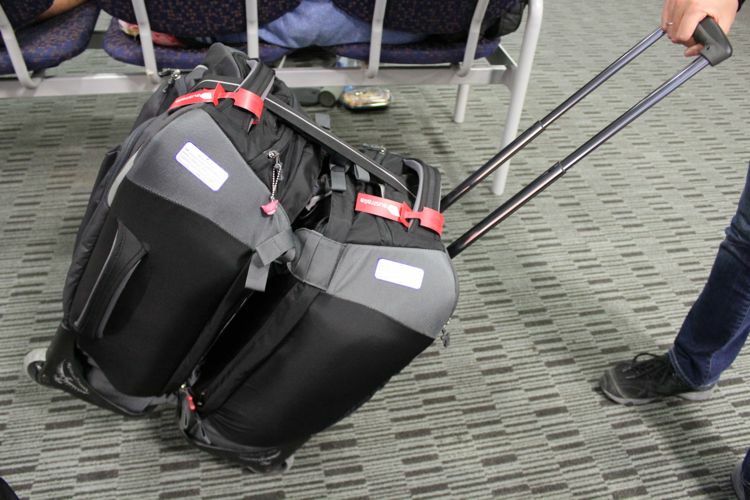 We love the durability and functionality of the bags but they are worthless for trying to get around checking bags in Europe if using any of the budget airlines. As mentioned before guys. This is one of the best reviews online. I’m currently two months into my South American trip. 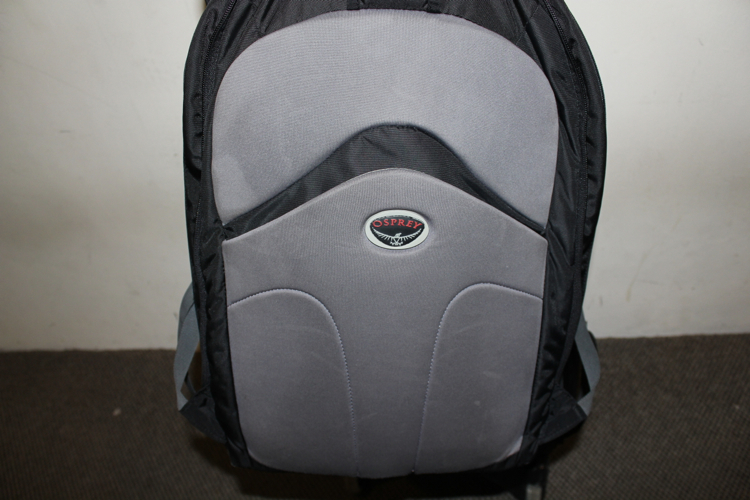 I went with the Osprey 22L Meridian, but also elected for the 34L stratos from Osprey. The Stratos is way more comfortable. I still kept the detachable day pack on the meridian, but I’m trying to be disciplined about not packing it full so that I can detach it and actually use it as a day pack for going to the beach and the like. Theory seems to be going well so far. Great recc on the locktite as well. If anyone is worried about size in the meridian. It’s pretty small, but with some planning you can actually get a lot in it. I have my packing list on my site. Definately one of the best review for the Meridian 22 I’ve read so far. 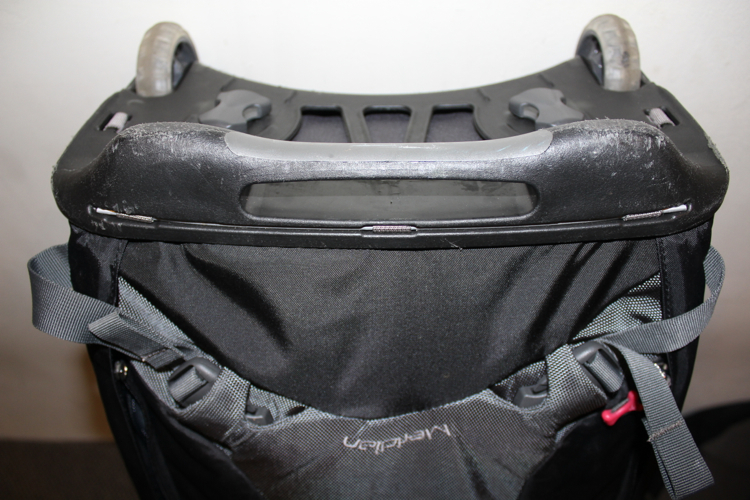 The main reason I bought the Meridian 22 was the removable daypack, the rugged wheels and good straps possibility and of course the carry-on size. Next step will be to convince wifey that she also need only a carry-on to travel to Asia (which we usually do every year). 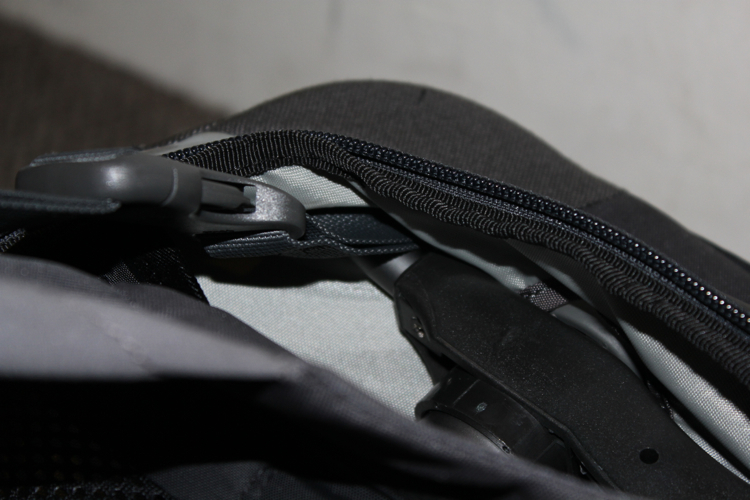 Only drawback of it is the unabilty to attach the front day pack with buckles on the main harness. 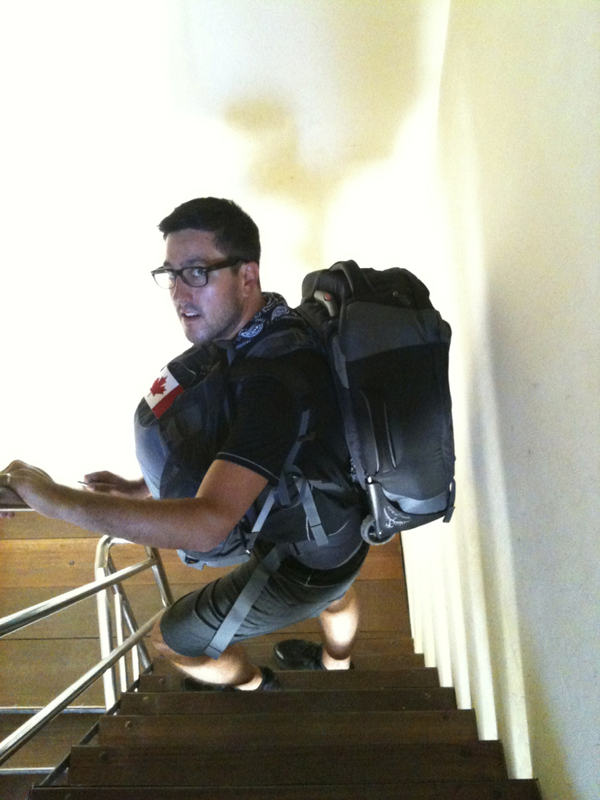 I’ve seen you both carry it on but using the daypack harness instead, which is not bad. But directly with buckles clipped it would be better.